George Takei is an American actor and author, best known for his role as Hikaru Sulu, helmsman of the USS Enterprise in the television series Star Trek. He also portrayed the character in six Star Trek feature films and in an episode of Star Trek: Voyager. 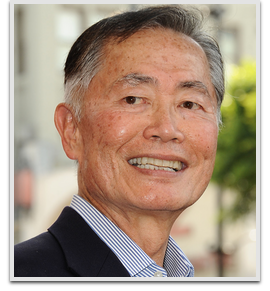 Takei is also notable for being the first major actor from Star Trek to lend his talents to a Star Wars project, voicing the character Lok Durd in the Cartoon Network series Star Wars: The Clone Wars.